“Outraged Love – The sermon preached at the 11am Service at Dunfermline Abbey on Sunday 30th August 2015 by the Minister, Rev MaryAnn R. Rennie. 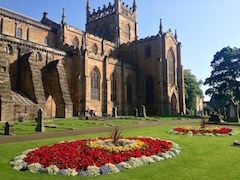 “Take Two Gardens” – The sermon preached at the 11am Service at Dunfermline Abbey on Sunday 23rd August 2015 by the Assistant Minister, Dr jean Kirkwood. The flowers are out at the Abbey on a beautiful sunny Sunday morning! Read more"Flowers Inside and Out!" 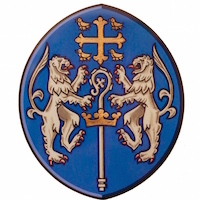 “Searching for Meaning – The sermon preached at the 9.30am Service at Dunfermline Abbey on Sunday 16th August 2015 by the minister, Rev MaryAnn R. Rennie. “Cheering with Wisdom” – The sermon preached at the 9.30am Service at Dunfermline Abbey on Sunday 9th August 2015 by the minister, Rev MaryAnn R. Rennie. 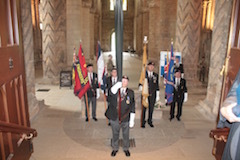 Read more"Blessing and Presentation of New Standard"
“The Fear that Inspires Life” – The sermon preached at the 9.30am Service at Dunfermline Abbey on Sunday 2nd August 2015 by the minister, Rev MaryAnn R. Rennie. Read more"The Fear that Inspires Life"